We offer the sacrament of baptism for people of all ages, including infants, children, and adults. Baptism is incorporation into Christ. Baptism enacts and seals what the Word proclaims: God’s redeeming grace offered to all people. Baptism is God’s gift of grace and also God’s summons to respond to that grace. Baptism calls to repentance, to faithfulness, and to discipleship. Baptism gives the church it’s identity and commissions the church for ministry to the word. Baptism represents our first step on the journey of faith. We become members of God’s family, joined with members of our congregation and with Christians everywhere. Jesus gave this command to the disciples: “Go therefore and make disciples of all nations, baptizing them in the name of the Father and of the Son and of the Holy Spirit” (Matthew 28:19). In baptism, we participate in Jesus’ death and resurrection. We die to what separates us from God are are raised to newness of life in Christ. The body of Christ is one, and Baptism is the bond of unity in Christ. Just as we are united with Christ through faith, baptism unites the people of God with each other and with the church of every time and place. Barriers of race, gender, status, and age are transcended. Baptism signifies: the faithfulness of God, the washing away of sin, rebirth, putting on the fresh garment of Christ, being sealed by God’s spirit, adoption into the covenant family of the church, and resurrection and illumination in Christ. At What Age Do We Baptize? No matter the age at which you are baptized, baptism celebrates the start of a new life in Christ. Parents may bring their infants or a child for baptism on the basis of their own faith, with the hope that the child will grow in faith and love and serve God. Adults my present themselves for baptism through their profession of faith. The Presbyterian Church (U.S.A.) recognizes all Baptisms with water in the name of the Father, of the Son, and of the Holy Spirit administered by other Christian churches. Baptism is received only once. The commitments made at our Baptism are reaffirmed as we celebrate the Baptism of another and as we partake in the Lord’s Supper confessing our ongoing need of God’s grace. Normally, the Sacrament of Baptism is administered in the presence of the congregation during a worship service. During the service, persons to be baptized come to the front and stand near the baptismal font with the pastor and an Elder. When a young child is baptized, the child’s parents (or guardian), also gather at the font. 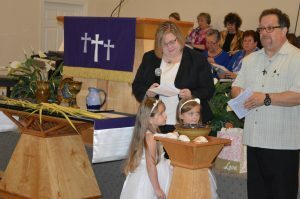 The pastor will introduce the sacrament and present questions to the person or parents, and the congregation promises to nurture the child/adult; then the pastor administers the Sacrament of Baptism. The visible sign in baptism is the sprinkling or pouring of water, which signifies our cleansing from sin, our regeneration, our being made new by the work of Christ. If you would like to discuss a Baptism further, please fill out the appropriate form and contact the church office.